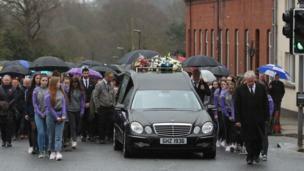 Images from the funerals as Lauren Bullock, Morgan Barnard and Connor Currie are laid to rest. 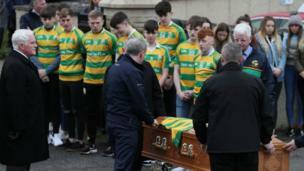 The funerals are being held for three teenagers who died in a crush outside a St Patrick's Day disco last Sunday. 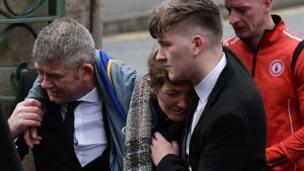 Morgan Barnard, 17, Lauren Bullock, 17, and Connor Currie, 16 were all killed in the St Patrick's day incident at the Greenvale Hotel in Cookstown. 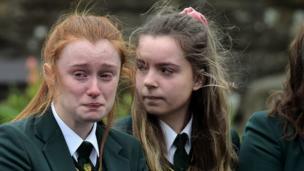 School children formed solemn guards of honour in tribute to the young victims. 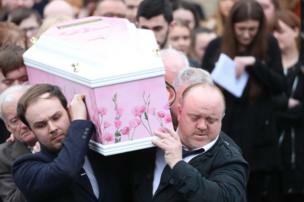 Hundreds of mourners turned out for the funerals of Lauren Bullock at St Patrick's Church in Donaghmore and Morgan Barnard at St Patrick's Church in Dungannon. 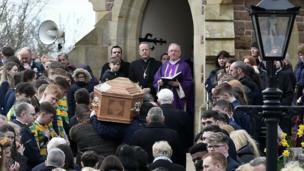 Connor Currie's funeral took place at the Church of St Malachy in Edendork. 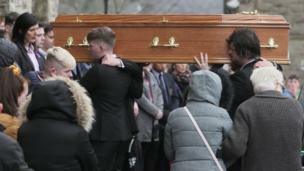 Mourners Connor Currie's funeral heard how he "lit up a room as he entered it and his infectious smile warmed everyone's hearts". 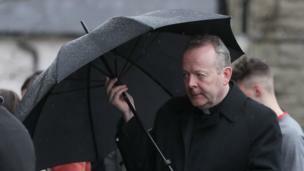 Speaking at Morgan's funeral, Archbishop Eamon Martin, head of the Catholic Church in Ireland, said the deaths had turned the area into "a valley of tears". 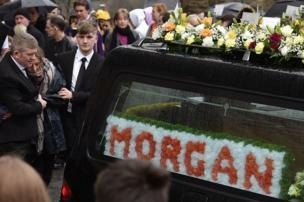 The family of Morgan - whose mother, Marie, was comforted by family as she entered the church - described him as someone who "brightened up the classroom with his humour"
Morgan was described as a "vivacious, charismatic and energetic" young man who always had a smile on his face. 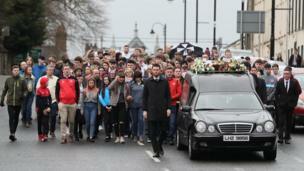 Mourners at the funeral of Lauren Bullock heard how she was "energetic and full of life".